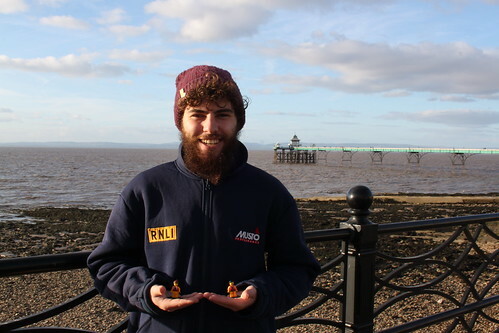 For some time now, the little guys have been following the progress of Alex Ellis-Roswell, who is walking around the coastline of Great Britain to raise money for the RNLI. 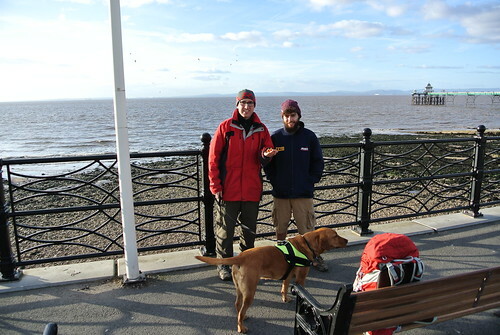 And when I noticed on Saturday evening that he was in our neck of the woods and planning to walk from Weston-super-Mare to Portishead the next day, I couldn’t resist getting in touch to see if he wouldn’t mind the Crew and I tagging along. 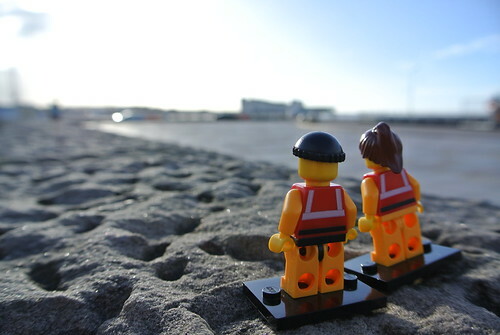 And so it was that the little guys and I found ourselves at Weston-super-Mare lifeboat station the next morning, waiting for the intrepid long distance walker to arrive. The Crew kept a sharp look-out down the promenade, keen to spot Alex as soon as he appeared. 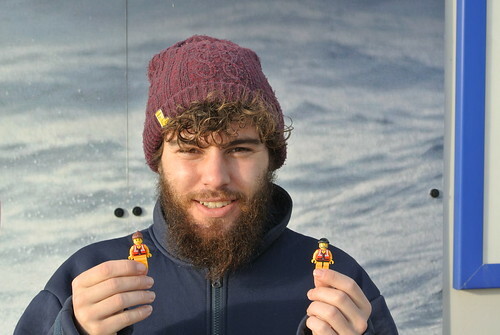 We didn’t have to wait for long, though, as Alex soon rocked up and was keen to meet the Crew. Having started his walk in Kent in August last year, he was well into his stride. And he’d even managed to convince someone to transport his rucksack to Portishead by car, meaning that while I was lugging a pack full of camera, sandwiches and LEGO, Alex sauntered along with a nothing more than a plastic bag containing a sandwich and an energy drink. 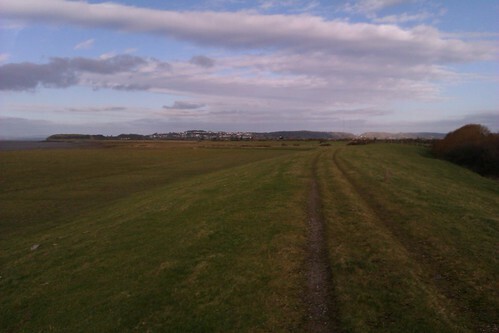 We started by heading north from Weston up along the coast to the village of Kewstoke. At this point, the geography of the coastline (and, in particular, the number of drainage channels leading into the sea and the lack of bridges over them) meant that we had to turn inland. 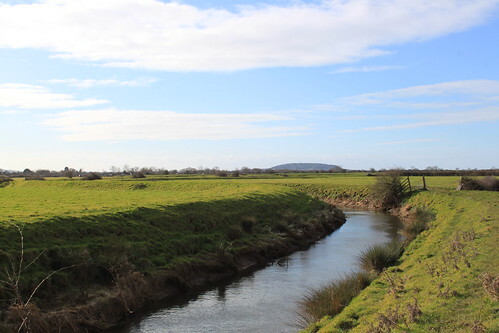 So we meandered across the North Somerset levels towards Hewish, crossing over the M5 motorway in the process, before turning back towards the coast. We stopped for lunch in the middle of the levels, with the incredibly flat landscape offering stunning views in all directions. I was keen that Alex got to experience the best that our part of the world offers and thankfully the weather, for once, played along. 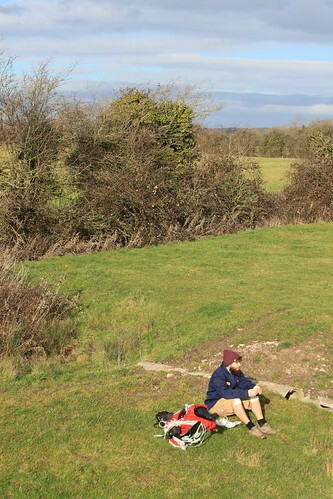 It was a bit chilly, sure, but the sun shone brightly all day and the fields around us glowed with an unusual warmth. The Crew were a bit peckish by this point, too, so tucked in to a sandwich. Please note that, in the photo below, they are eating the sandwich. They are not in the sandwich. In mean, I was hungry, but not that hungry. As late-afternoon turned to early evening, we stumbled into the regency town of Clevedon, with its famous (around here, at least) pier. We stopped for a quick photoshoot and the Crew took this opportunity to stretch their legs. 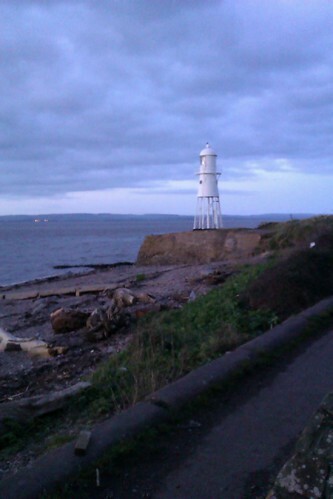 We were also joined here by Molly, my Labrador, who was to walk the last seven or eight miles with us to Portishead. She’d already met Alex when we set off from Weston and seemed happy to be participating in our little adventure. Well, my little adventure. Alex’s 6,500 mile journey around the coast is clearly quite a significant adventure. As we were walking along the coast path, we met a family looking a little frantically for their red setter dog. We’d not seen it, but promised to keep our eyes open. And a little while later, we did indeed come across an owner-less red setter, padding around and generally minding its own business. Seeing that Alex was now in good hands with the Portishead lifeboat crew, Molly and I bade him farewell and continued on our way into town. 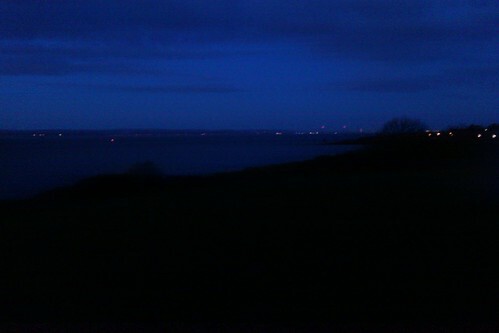 It was getting dark at this point and we had fantastic views across the Severn estuary, with the lights of the two Severn bridges shimmering in the distance. And then, after eight hours and twenty-odd miles, we two weary travellers headed downhill to the marina, where Natalie was waiting to drive us home. The little guys and I were honoured to meet Alex and to have the opportunity to support him – in a small way – in his awe-inspiring trek. We look forward to following his onward progress and urge you to support him, too. You can find him on Twitter and on Facebook. And when he comes to your neck of the woods, perhaps you could tag along with him for a while, too. This entry was posted in Out and about and tagged Long Walk Round, RNLI, The Lifeboat Crew by Simon Perks. Bookmark the permalink.